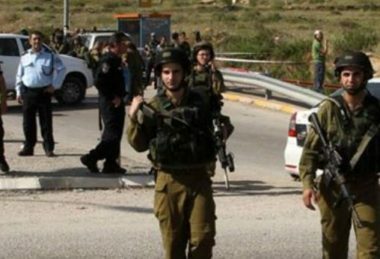 Israeli soldiers abducted, Sunday, two Palestinians from Sa’ir and Doura towns, northeast and south of Hebron city, in the southern part of the occupied West Bank, and installed a roadblock at the entrance of the al-Fawwar refugee camp, south of the city. Media sources said the soldiers invaded and searched many homes in Sa’ir town, northeast of Hebron, and abducted Mohannad Mahmoud Jaradat, 20. They added that the soldiers also searched homes in Doura town, south of Hebron, and abducted Hamza Mousa Darabea’. In addition, the soldiers invaded the home of a political prisoner, identified as Ali Salhab, in Hebron city, and violently searched it. The soldiers also installed a military roadblock at the entrance of the al-Fawwar refugee camp, before stopping and searching dozens of cars, and interrogated many Palestinians while inspecting their ID cards. In related news, the soldiers attacked of schoolchildren while standing in line before the beginning of the school day in Hebron Elementary School, causing dozens to suffer the effects of teargas inhalation.